Natural Chemistry founded in 1989, is the leading maker of all-natural products for pools, spas, water treatment, pet care, and home products. • Formulated With Cinnamon Oil, Cedar Wood Oil, Clove Oil and Vanillin Exclusively For Cats. • Not Only Kills Fleas On Contact But Is 100 Percent Effective In Killing These Parasites For One Week. • Also Effective On Flies, Ants, Cockroaches, Silverfish, & Scorpions! 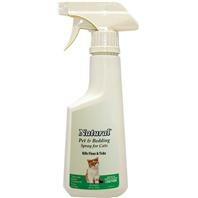 • Natural Product Kills Fleas & Ticks!